Florida has its quirks. Gators in the lakes and rivers. Buildings that are low slung and spread out which demands that you drive everywhere. Good roads that you leave to the tourists because they drive like idiots. No, really, Tourists here drive "worse than I do". But it is the Sunshine State. Sunshine most days, and in the summer it can be quite bright. Brilliant might be a better description. The homes aren't built to allow light in, those low slung boxes are normally built to keep the sun out. Large overhangs, Bahama Shutters, and awnings will help keep the sun indirect. Too much of a good thing can be a headache. Things fade quickly, plastics and fabrics will dry out. My futon in the back room has a hunter green cover to it that faded to a pastel in spots, streaked, and generally looks like something you might encounter wadded up in a corner of an old city. That happened in about 6 months. Anyone want a Futon frame? It's a great piece of furniture. Solid hardwood frame, it'll clean up good. You just need to replace the cover on the mattress. But we do tend to hide from the sun here. You can play the game we play called "Spot the tourists". I told you how to spot them on the roads - just look at the interstates. The locals use the surface routes. No, I mean in the malls. You spot them because they're wearing shorts in February, or they have a tan. People here tend to hide from the sun or they've decided to go "all in" and tan their hides to the point where it resembles the finish on the wainscoting in front of my chair. Dry and brown. Leathery. Shorts? In Florida? You have to be kidding! Those mosquitoes will carry off a Buick! That's why that one morning I had to stop waging war against the sun and marvel that the sight even happened in the first place. It only happens in this house for a good 15 minutes and only in the winter. The sun angle has to be just right. It has to be in the morning. You have to be at the right place at the right time. On the desk in the Florida Room, I started putting oddball things to block that one errant sunbeam that shines right in my eye. It's either that or have breakfast from 7:32 until 7:46 in the morning. Give or take a few seconds. In January. I guess in November too. That one moment though. Have you ever stopped and looked at something that annoyed you, for months, and thought in an ephiphany that it was beautiful? I did. The simple things in life? 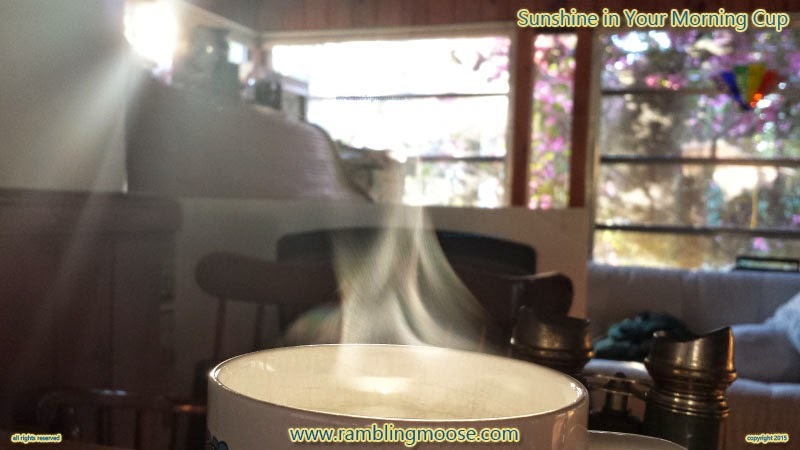 It all comes down to a window, a sunbeam, and steam rising off the morning cup. Complete with the faintest rainbow I had ever seen indoors.